Thanks to the X-ray satellites Chandra and XMM-Newton, an international team including the Department of Astrophysics of CEA-Irfu has just discovered the existence of two bubbles of hot gas escaping to distances of about 500 light-years, on both sides of the massive black hole environment, in the center of our galaxy. Like the messages of Native Americans transmitted by smoke bubbles visible from afar, these "hot gas chimneys" tell us today about the intense past activity of the black hole and the central regions of our Galaxy. These results are published in the journal Nature of March 21, 2019. The regions in the center of the Milky Way represent a real laboratory for high energy astrophysics. They have already been the subject of numerous studies, using X-rays that can trace the most energetic phenomena in the region, especially the very hot gas present in the immediate vicinity of the supermassive black hole Sagittarius A *, located in the center of our Galaxy. This central black hole, more than 4 million times the mass of the Sun, is currently particularly inactive. So far, he is only persistently responsible for strong radio wave radiation and very low X-ray emission as well as for some low luminosity bursts that seem to be associated, observed in X-rays and infrared frequencies. However, the recent observation by the FERMI high energy gamma satellite of large structures, called "Fermi bubbles", towards the galactic center suggests episodes of violent activity in the past. Discovered in 2010, the "Fermi bubbles" are two large volumes of very high energy (GeV) gamma emission , extending about 25 thousands of light-years, on both sides of the Galactic plane . They testify to an exceptional activity at the heart of our Galaxy. Yet their origin remains a mystery and their direct association with the central black hole has yet to be demonstrated with certainty. 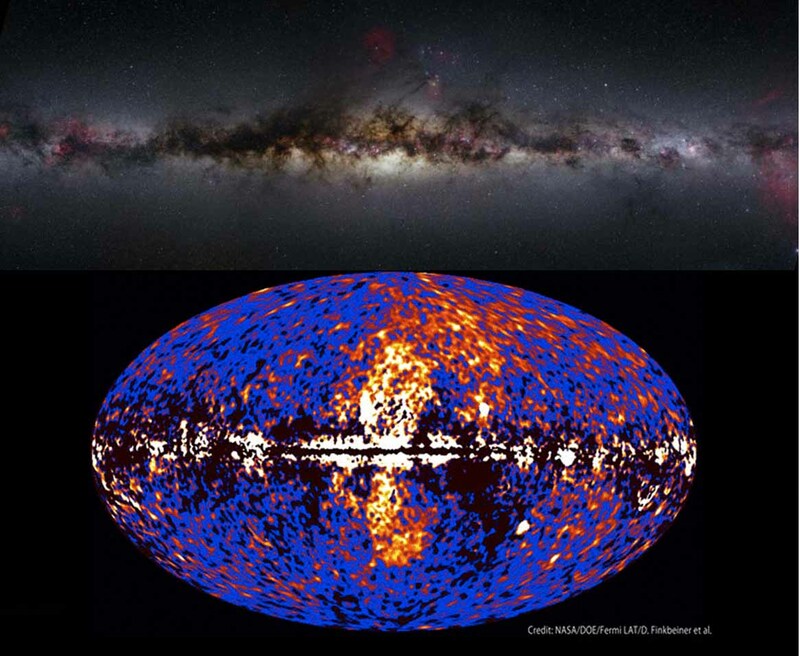 Top: image of the galactic plane in visible light. In the center of the image, the galactic center sheltering the massive black hole is totally obscured by the dust. From 2016 to 2018, the team of researchers, including astrophysicists of Department of Astrophysics of CEA-Irfu and the laboratory Astroparticle and Cosmology of Paris (APC), as well as the Institute of Planetology and Astrophysics of Grenoble (IPAG) with the support of the National Center for Space Studies (CNES), then mobilized the European satellite XMM-Newton to establish a large-scale X-ray map of the central region of the Galaxy . Nearly fifty new observations over a total duration of more than 300 hours in two campaigns, together with observations already acquired by the satellite that has been in orbit for nearly twenty years, have resulted in a spectacular image. The X-ray emission map, which covers an area of ? ?1800 by 1500 light-years at a distance from the galactic center, revealed the existence of true gas "chimneys", two cylindrical structures that seem to be filled a very hot gas, at temperatures of several million degrees, escaping on both sides of the center of the Galaxy. These chimneys culminate to a height of about 500 light-years, perpendicularly above the galactic plane, exactly in the axis of the Fermi bubbles. Low-energy X-ray image of the region around the galactic center, obtained with XMM-Newton data between 2016 and 2018, as well as archive data. The color code indicates the detected X-ray energy: red (1.5-2.6 keV), green (2.35-2.56 keV) and blue (2.7-2.97 keV). Point sources have been hidden and appear as white circles. The total area is 1800 by 1600 light-years around the massive black hole Sgr A * in the center (marked by a diamond). The plan of our galaxy is indicated in the middle by the horizontal line (in white dotted lines) as well as the base of the big "Fermi bubbles". The two white ellipses on either side of Sgr A * (in dashed lines) show the new chimney-shaped structures highlighted by the XMM satellite. According to one of the authors, Andrea Goldwurm from the Department of Astrophysics at CEA and the Astroparticle and Cosmology Laboratory in Paris who has conducted numerous studies of the high-energy galactic center: "The most convincing hypothesis is that hot gas chimneys that we have discovered are the channel that carries the energy from the active region of the center of the Galaxy outward, thus feeding the Fermi bubbles, as their morphology suggests. " Nevertheless the immediate link with the super-massive black hole is not fully cleared. According to Maïca Clavel of the Institute of Planetology and Astrophysics of Grenoble, co-author: "Although this link seems suggested because of the probable intermittence of energy injection from central regions, it can not be fully proven because of uncertainties about the exact shape of hot gas chimneys close to the black hole and the complexity of this central region ". Outside the massive black hole, the center of the galaxies is indeed very rich in stars and it can not be excluded that the chain star explosions (supernovae) or even the wind of particles from very massive stars is also a major source of energy that can supply the hot gas chimneys. The suggested link between the XMM gas chimneys and the large FERMI bubbles is nevertheless an important clue that the activity of the center of our galaxy has been very intense in the past, only a few million years ago. The central black hole is more than ever under surveillance. 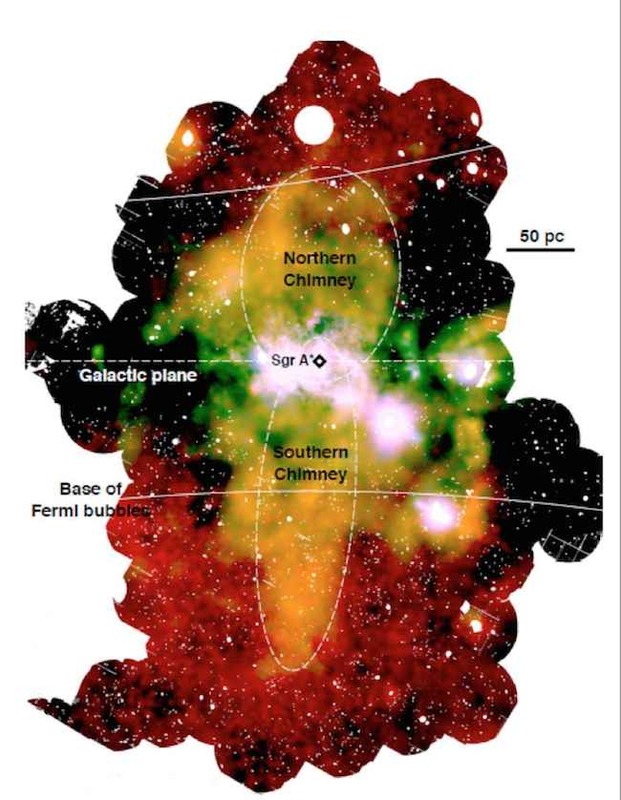 "An X-Ray Chimney Giant of Galactic Center"